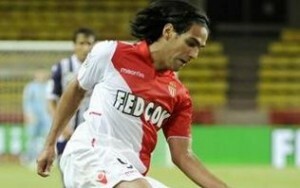 Radamel Falcao was kept relatively quiet as Tolouse held Monaco to a goalless draw in their Ligue 1 clash. Joint league leaders Monaco were reduced to very few chances in a game played behind closed doors due to crowd trouble in last season’s fixture against Le Mans. The hosts had 20 shots on goal throughout the 90 minutes, but only five on target with Emmanuel Riviere testing Toulouse keeper Ali Ahamada early on in the first half. The best chance of the game came on the half hour mark as Lucas Ocampos ventured down the right wing before sending an effort towards goal. Ahamada failed to deal with the shot effectively as the ball spilled onto the edge of the six yard box with Yannick Carrasco looming. Seemingly with very little to do to put his side ahead, somehow the winger managed to scoop his effort over the bar with the Toulouse custodian still on the ground. Colombian striker Falcao had a number of speculative efforts without really testing Ahamada as the game entered its final stages. With three minutes to go, Monaco nearly nicked a win as midfielder Jeremy Toulalan unleashed a powerful strike from 30 yards that had Ahamada beaten, but the ball flew to safety after crashing off the crossbar.